University students heading back to school in the United Kingdom will find their Chabad centers on campus expanding in new directions. Opening a daycare, Hebrew schools and mikvahs, Chabad on Campus UK is serving students as their lives take on the complexities of adulthood and family. For Avi and Elisheva Machlis, raising three children on a campus without an active Jewish community may have been one of the more challenging aspects of Elisheva’s studies at Cambridge University, where she earned her doctorate in Middle East studies. 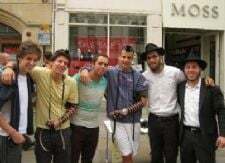 Over fifteen yeshiva students got together for summer yeshiva in London from after Tisha B'av until the beginning of the month of Elul. The programme, beginning at 8:00 am and ending at 10:00 pm, was held under the direction of Rabbi Chaim Rapaport. 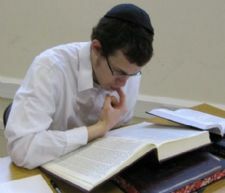 The idea of a summer yeshiva fulfills the directive of the Luabvitcher Rebbe, of righteous memory, to never take a vacation from learning Torah. 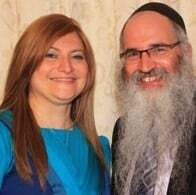 Other teachers included Rabbi Leibish Heller from the Lubavitch Yeshiva Gedolah in Kingsley Way, London, and Rabbi Y. D. Klein from Manchester. There was also a two hour lunch break for recreational activities, when the bochurim played tennis, football and table tennis. Some 1500 children attended Jewish Summer day camps organised by Chabad Lubavitch centres in London, Edgware, Ilford, Wimbledon, Bournemouth, Leeds, Birmingham and Manchester. Children from all religious backgrounds enjoyed a huge array of educational and recreational activities organised and run by experienced camp leaders and counsellors from the UK, USA, France, Belgium and Israel. When Rabbi Fishel and Esther Cohen came to Birmingham, England, in 1984, neither had any idea what the future would hold. He, a young Chabad-Lubavitch rabbi fresh out of school, had been asked to become the area’s first full-time university chaplain for the Midlands Region, providing religious and pastoral support to Jewish students attending universities in Birmingham, Warwick, Woverhampton, Derby, Coventry, Loughborough, Leicester and Nottingham. She, barely 20 years old, faced her own challenges in building a home and Jewish center far from her family in Rio de Janeiro, Brazil. Among the roadblocks was confronting a dearth of kosher facilities; running out of staples such as milk or bread was not an option. Leeds is opening a Jewish educational centre where children can take a walk through time into a 19th century eastern European shtetl. The Jewish Heritage Centre for Children, due to open in October, is the brainchild of Leeds Lubavitch education director Shoshana Angyalfi and her project co-ordinator Ruth Bell, who gave the Jewish Chronicle a sneak preview of the museum. Mrs Angyalfi said: "Each house in the shetl shows a different aspect of Jewish life. We have the scribe's house where we learn about the Torah. There is a succah, and a candle store where we learn about the different uses for candles - for Shabbat, for Chanucah, for yahrzeits (memorials). 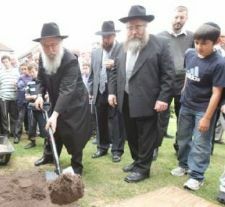 Some 150 people turned out last Sunday morning at Lubavitch of Edgware to a joint celebration making the groundbreaking of centre’s new mikvah and Rabbi Leivi Sudak 50th birthday. Supporters, friends and rabbis from all over London participated in the symbolic turning over of the soil, the mixing of cement and the laying the first stones of the new building. 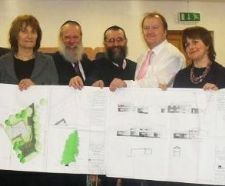 Among the honoured guests were Rabbi Nachman Sudak OBE, principal of Chabad Lubavitch UK; Rabbi Shmuel Lew, head of Lubavitch Senior Girls' School and member of the directorate of Lubavitch UK; Dayan Levi Raskin; and Rabbi Yitzchok Sandler, director of Aish in Edgware.